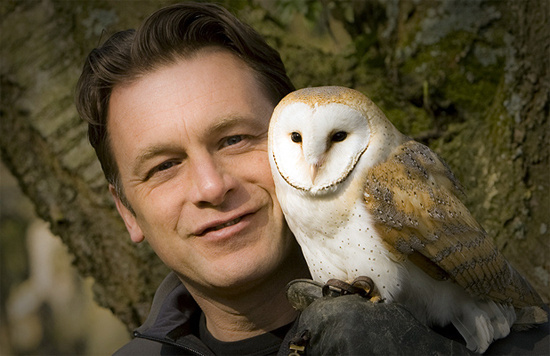 Chris Packham was a familiar figure to any child of the late 80s and early 90s as one of the three presenters of the brilliant Really Wild Show, one of those rare kids programmes that managed to keep the perfect balance between entertainment and education. Since then, of course, Packham has moved on to helm the BBC's Springwatch series, where he's become notorious for shoehorning song titles by some of his favourite bands into the script. Obviously a serious music lover, he seemed like the perfect candidate for a Baker's Dozen. We catch him hours before flying off to Greenland to film a new BBC series called Operation Iceberg, a programme that'll look at "the narrative is the life history of an iceberg, which starts as snow at the top of a glacier, then ends melting somewhere in the Atlantic" to air on the broadcaster this autumn. Back in the day, presenting The Really Wild Show alongside the very prog-looking Terry Nutkins, Packham cut quite a dash with his tight short back and sides, and bleached blond on top. I remember when first encountering a picture of Depeche Mode and thinking 'that Martin Gore has a proper Chris Packham, hair do'. "My hair used to change colour all the time, when it got to Really Wild Show it stayed blonde for quite a long time," Packham says. "Before that it was all sorts of crazy colours. When I was 15 or 16 it started, with the punk thing, which has been and remains an instrumental and formative part of my life. The whole attitude of do it yourself, get out there, work hard and get yourself a place on the poster. That was something I've stuck to. A lot of the punk anthems have remained mantras for my life. If I get really down and I think I'm not getting anywhere then a good dose of 'Shout Above The Noise' by Penetration normally brings me back." As well as the records, Packham was an avid gig-goer back in the day. As he'll go on to tell us, he'd often be found hitch-hiking from rare bird spotting to punk gigs, where he'd get properly stuck in. "I remember a few gigs when things turned nasty," he says. "I remember a Crass gig which got invaded by skinheads and turned very nasty. I went to see Sham 69, one of their last gigs, and that turned into a riot, a nasty riot. The gigs were rough and ready, but if you were right at the front, pressed against the stage, then it was all happening behind you." As far as his Baker's Dozen goes, Packham explains his choices thus: "I thought I'd pick the albums that were the ones I played completely. It'd have been tempting to pick more than one of the Jesus & Mary Chain because they were my favourites, but I've stuck to one of each." Click the image below to begin the countdown. Chris Packham's Secrets Of Our Living Planet is on BBC Two this Sunday, July 8th at 8pm.